Lindsey Pulliam takes a mid-range jumper. The freshman guard was a key contributor in the second half in the Wildcats’ win over Wisconsin. Jordan Hamilton started the possession biting her jersey as she dribbled the ball up the floor, nervous in her first down-to-the-wire conference game. Then, she blew by a Wisconsin defender and converted an easy layup to give Northwestern a 61-56 lead with less than two minutes to go. Hamilton’s basket was part of a 12-0 run that allowed the Wildcats (9-10, 2-3 Big Ten) to extend their lead down the stretch, eventually pulling out the 69-60 victory Thursday at Beardsley Gym. Against the Badgers (7-11, 0-5), the freshman guard put an opponent away from the free throw line for the first time in her career, finishing the day with a career-high 22 points. It was a performance and a win coach Joe McKeown said the Cats desperately needed. 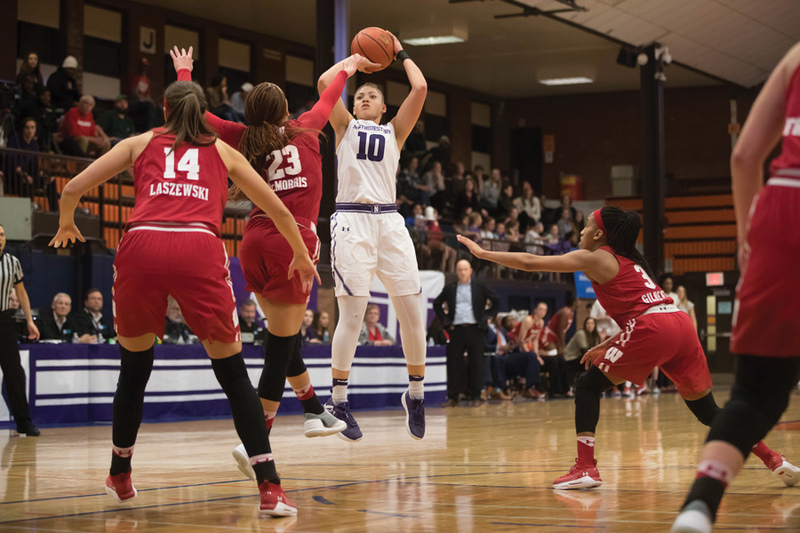 As freshman guard Lindsey Pulliam, NU’s leading scorer on the season, struggled with foul trouble throughout the first half, Hamilton and sophomore forward Abi Scheid were forced to step into more significant roles. McKeown also turned deep into his bench in the first half, putting senior center Oceana Hamilton and sophomore forward Abbie Wolf in more central roles than in many games this season, and the duo helped limit Wisconsin to just 11 points in the first quarter. For stretches in the first half, McKeown played three of his post players, including junior center Pallas Kunaiyi-Akpanah, at the same time, and Hamilton said the changed rotation with fewer playmakers made her more aggressive throughout the game. Pulliam dealt with foul trouble throughout the game and only scored 6 points in 27 minutes, but she put her stamp on the game with a personal 5-0 run in the third quarter. The spurt gave the Cats a two-possession lead for the first time, as she single-handedly turned momentum toward their side. After making a 3-pointer near the end of the third quarter, Pulliam hit a contested, fast-break jumper the next time down the floor. Wisconsin called a timeout, and Pulliam fist-pumped in celebration of the basket that gave NU its biggest lead of the game at the time. Aside from Hamilton, McKeown said Kunaiyi-Akpanah played the biggest role in the Cats’ poised performance down the stretch. She added 11 points and 18 rebounds, securing her 10th double-double of the season, and she scored 5 in the last four minutes of the game. In the pivotal stop that clinched the Cats’ 11-0 fourth-quarter run, Kunaiyi-Akpanah contested Courtney Fredrickson’s shot at the rim and collected her final rebound. McKeown said the defense of Kunaiyi-Akpanah and sophomore forward Bryana Hopkins, starting in place of injured senior guard Lydia Rohde, put NU in command of the pace of the game in the second half. To build on this this win, McKeown said the Cats will have to capture the defensive intensity they ended the game with. Shifting between a full-court trap and a switching zone defense throughout the fourth quarter, NU outscored the Badgers by 7 in the last 10 minutes, sealing the result with solid defense.